I used to hate zinnias–they way they stood up so straight and tough and obvious, each perfect concentric petal looking like it had been screwed into place in a botanist’s workshop. Now, though, on other side of 65, I love these happy indomitable soldiers. Once they get established, their tough upright stems say that nothing will mess with them, they are the last men standing. Their colors blaze out bravely before everything gets blasted with hard frost. They cheer me so much that I want them by my elbow now at all times. I bring in a fistful of orange ones and put them in a vase my youngest daughter made in high school. I don’t know how she got the textured pattern onto the clay, but it mimics the perfect tight structure of the flowers it now holds. 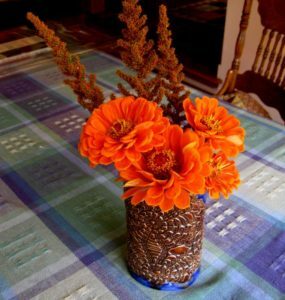 The girl who made the vase has since become a woman and borne a boy-child who sometimes sits at our table, a small sun warming us with with his silliness and his serious wonderings. Flowers, vase, daughter, boy, table.